Chelsea Football Club has helped set up a football league in Surrey for people with mental health problems. Five teams from across the county played their first tournament in Surrey Positive Mental Awareness League (PMA) at Chelsea's training ground in Cobham. Each team had seven players and games lasted for eight minutes each. Chelsea defender Ricardo Carvalho said: "We believe football can have a positive impact on people's lives and I wish the league the best of luck." 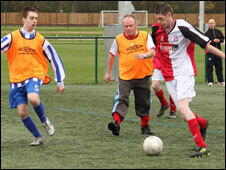 Surrey Football Association also helped the county council and Surrey and Borders Partnership NHS Foundation Trust to form the league. It is modelled on a similar league already playing in London, and is aimed aimed at raising players' self-esteem and keeping them active. The first tournament was won by Kingston-based A3 Milan, from the London PMA. A county council spokesman said a committee was meeting this month to organise fixtures and training for the new teams.